Acoustic treatment manufacturer GIK Acoustics is launching a corner bass trap option as part of the Impression Series line of room treatments. The new Impression Series corner bass trap utilizes the size and shape of the Tri-Trap corner bass trap to provide low-frequency absorption and adds the scattering effects of the Impression Series plates to effectively keep mid- and upper-frequencies in the room. The result is even, tempered bass control as well as improved high-frequency balance and ambience. 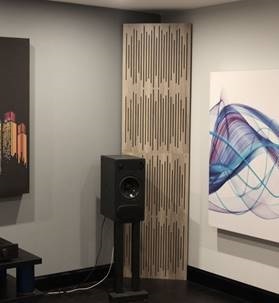 The Impression Series Corner Bass Trap is available in twelve elegant patterns: Basketweave, Braids, Palomar, Sunrise, Wavy Leaves, Bubbles, Checkerboard, Gatsby Arches, Mod Geometric, 3D Cubes, and Digiwave (horizontal & vertical). Plate finish options include Blonde wood veneer, Black veneer, White veneer, Grey Elm veneer, and Mahogany veneer. First introduced in January 2017, the Impression Series acoustic panels and bass traps combine proven, effective absorption with beautifully decorative plates to deliver an aural and visual statement to enhance any room. The rigid plate not only gives the panel a stylish appearance but also helps reflect/scatter high frequency content in the room giving the proper balance needed. Previous articleWhat is a headphone amp, and why would you need one?